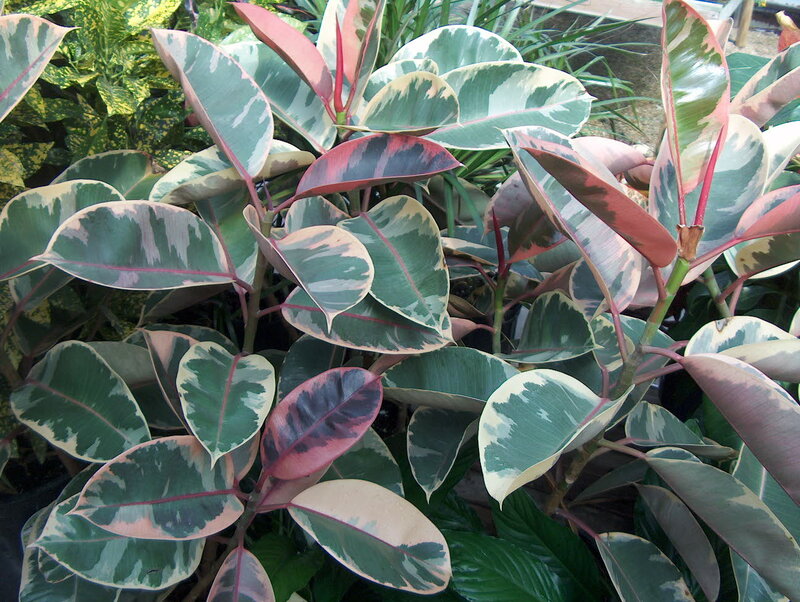 Comments: This is a relatively new selection of the rubber tree that sports interesting green and white variegated leaves with overtones of burgundy. Rubber plants are popular for interior plantings, but most places do not have sufficient natural light to keep plants growing well. Leaf drop is a common problem in poorly lighted interiors. This selection has the same pests as the more common green rubber plant -- scale insects, aphids, mealy bugs, and spider mites. Pests are very troublesome when plants are growing in stressful conditions like poor light conditions. Use a commercial potting mix for interior plants and keep the soil only slightly moist to the touch for best results.